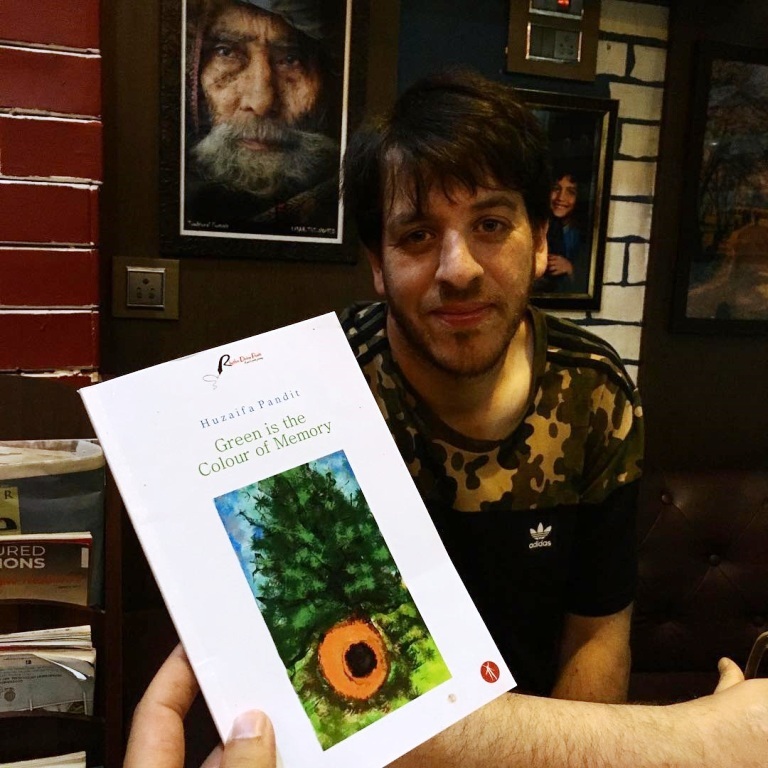 Huzaifa Pandit’s poetry collection Green Is The Colour Of Memory was in fact selected by Rhythm Divine Poets as the winner of their 2017 Poetry Chapbook Contest. The title, Huzaifa himself confesses, is a line borrowed from Randhir Khare’s eponymous poem and it immediately draws attention. Green and Memory are the two keywords here. While it is tempting to yield to the deceptively simple connotation of these two words and by extension read Huzaifa’s poetry in the same vein-poetry of nostalgia and reminiscences- but that would just be a semantic travesty as well as a syntactic tragedy because neither Memory nor Green is straightforward in Huzaifa’s poetry. Let us first consider the Memory’ part of it. At the rusted gates of the old cemetery crafted in my memory. reality by fantasy divide it in time and space. I will soon vomit memory. and the nation collided with its destiny. with wrenched twigs on baked clay? shall forthwith be considered a state enemy. when cold minutes prey on a mutilated memory. We wrote that this fire also feeds on our caned bones. Often, on cold grainy mid-nights the flag of your memory unfurls on the mast of tedious death. The doctor says hysterics suffer from reminiscences. surrendered every charade of a plan. their Lordships: I won’t atone my sins. Yet, every night, Master, my throat refuses to howl. Now coming to the overall style of Huzaifa’s poetry, Nabina Das in her wonderful introduction to these poems points it out so succinctly: “The language in this book is startling, and the emotions delicate. Like Shahid Ali, Huzaifa’s central style is ghazalesque, although he writes free verse deftly.”Per se there are only two poems in this collection, A Ghazal For Zahid and BUHU ush Sings An Elegy For Kashmir which maintain an outward structure of a Ghazal (to some extent) but ironically these two poems are the least ghazelesque of all the poems in this collection. Not because structurally they maintain no kaafiya but only radeef (English Ghazals have by and large done away with behr) and they have no Matla or Maqta proper but more importantly they are nowhere near that self-gazing, in-vocative voice that Huzaifa so effectively uses in the rest of ‘free-verse, non-ghazal’ poems. The voice that is so beautifully on display in poems like Getting Lost In Pune or in Testimony in February. In such poems Huzaifa the poet separates himself from Huzaifa the subject of his poetry (and repository of his Green Memories) and gazes upon the latter with such sadness and longing as the Ghazal Masters of yore did visa vis their beloveds. And this is precisely what renders such poems with an air of ghazelesque. Whenever and wherever such instances appear the poetry of Huzaifa Pandit invests itself with an ornate craftsmanship of a deft and subtle artist although it must be said that at times the verses do appear crumbling under the overload of the emotions-meanings they are trying to carry. Such a flaw is predominantly an outcome of the restraint that Huzaifa so precociously tries to maintain.